Abdelkrim Belamine was born October 23rd 1964 in Casablanca. 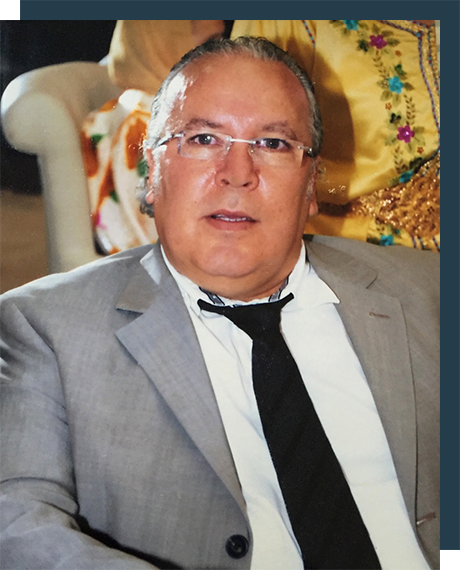 Prior to his graduation from The Tetouan national school of Fine Arts where he studied graphic Art and decoration in 1990, he had won the first prize at a painting contest in 1986 and another first prize at the watercolour landscape contest organised by his school. Belamine perceives in the act of creation, a willingness to communicate the immanence and transcendence of the Moroccan reality. Celebrated innovator, on the figurative style level, he uncovers secrets about the artistic knowledge through the sensitive natural and architectural beauty. For this purpose, he uses vibrant colours and vigorous touches that render a painter’s bewilderment at living and rediscovering typical scenes of Morocco. beautifully holding sway in the Arts scene. But, is a good academic training sufficient to reach success? No way. Abdelkrim Belamine is born to be an artist, since he comes from a family of artists. The only purpose from his academic training was to initiate, guide, help, and pedagogically assist him. Actually, thinking that an apparent difficulty triggers the interest of the observer is a mistake that can be fatal to some. Abdelkrim Belamine believes in his style. A style that he has been developing since his first works. Today, he is able to leave his personal signature and to impregnate his works with a special touch, to such an extent that connoisseurs detect this touch at first glimpse. In addition to that, his favourite themes are always drawn from deep Morocco, from culture, and from the Moroccan authenticity using however an approach that tends to move away from the subject so as to give it all its meaning and greatness back. This is done by integrating in the same context, time, space, nature, Man, environment, etc. In this way, he perfectly covers, dominates, and visually tames his theme by giving it colour and shape. Once all the work is done and set in place, he gives free rain to his talent and renders it all in a purely personal vision that enables the intrusion of subjectivity. Eventually, the end result is complete in all aspects.